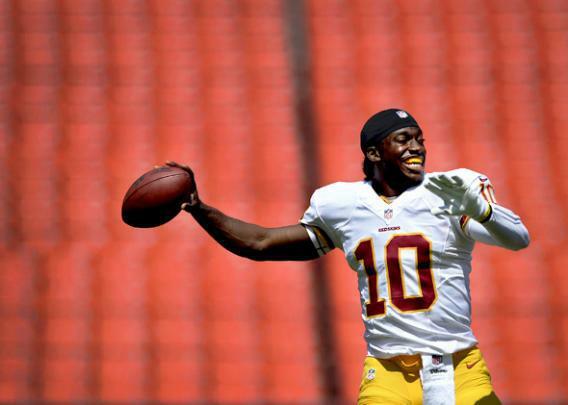 RG3 knee injury: Can Robert Griffin III save the NFL, or will pro football destroy him? Or will pro football destroy the first megastar of the post-CTE age? Washignton’s Robert Griffin III warms up before playing the Buffalo Bills during a preseason game at FedEx Field on Aug. 24, 2013 in Landover, Md. It’s a widely held and probably comforting view that sports are driven by “transformative” athletes, a procession of unprecedented individual talents—Pelé, Michael Jordan, Tiger Woods—that heroically drag their games to ever-escalating heights. Occasionally these players prompt physical transformations and rule changes, but usually their impact is more nebulous. Jordan never made anyone seriously consider raising the height of the hoop. He just played basketball better and more shrewdly than anyone else, and in doing so, he altered basketball’s cultural footprint, clearing the way for Kobe Bryant, LeBron James, maybe even Andrew Wiggins. Robert Griffin III, 23 years old with a twice-reconstructed right knee, is, we’re told, one of these transformative athletes. This offseason, Griffin has been the subject of two full-length books, Dave Sheinin’s RG3: The Promise and Ted Kluck’s Robert Griffin III: Athlete, Leader, Believer, and both frame Griffin as an epochal, superhuman talent. “Someday historians may look back at the Redskins’ second play from scrimmage in their win over the Saints and pinpoint it as the moment offensive football changed forever in the NFL,” writes Sheinin. Kluck’s explicitly faith-based book goes even further, offering up RG3 as a sort of Cartesian theological proof: “RG3 and football should remind us of who it is that we really worship. … There’s something in Robert’s game that suggests that God made him to do exactly this, exactly now.” Take that, Tim Tebow. Griffin was also the focus of a recent hourlong ESPN special that documented his rehabilitation process, his family life, and his insatiable thirst for Gatorade. And in May, Washington fans unearthed Griffin’s wedding registry and showered him and his fiancée with gifts, the sort of desperate affection normally lavished on a coveted free agent or a star player feared to be on the verge of departure. If Sunday football is America’s secular religion, all of this hagiography and breathless devotion has made Griffin seem like some blessed apparition: precious, magical, fleeting. We love him, and because we love him, we can’t stop worrying about him. On Monday night, Griffin will embark on what’s likely to be the most scrutinized, parsed and reparsed, second-, third-, and fourth-guessed season in the history of American professional sports. Some of this has to do with his position as arguably the most popular player in the country’s most popular game. Mostly it is because of that right knee, a body part that’s become a microcosm for America’s mixed-up love affair with football. As an athlete, marketing conduit, and general ambassador for the human race, Robert Griffin III leaves awfully little to be desired. A Texas high school football legend who was also a basketball star and an Olympic-caliber hurdler, Griffin passed on Stanford and Harvard to stay close to home at Baylor University, where he graduated with a 3.67 GPA, a degree in political science, and the 2011 Heisman Trophy. The following spring, Washington swung a blockbuster trade to draft Griffin second overall, after Andrew Luck. Before taking his first snap, the young quarterback had signed lucrative endorsement deals with Gatorade, Adidas, Subway, Nissan, and other corporate interests. Griffin did not disappoint any of his new employers. In his first season, he was named the NFL’s offensive rookie of the year, leading the league in yards per passing attempt and yards per rushing attempt while setting a rookie record for quarterback rating. This was one of the most electrifying debut seasons in football history, one in which RG3 appeared to usher the sport into a new era athletically, aesthetically, and culturally. The only thing to emerge totally unscathed from the events of Jan. 6 was Griffin’s reputation. RG3, everyone agreed, just wanted to play. And that’s ultimately the problem. The queasy precariousness of Griffin’s position has less to do with his particular injury history than with the fact that he plays football for a living. As the new NFL season begins, there’s a creeping understanding that the very arena that showcases his tremendous physical and mental gifts is fundamentally dependent upon the destruction of the same. Griffin is the first megastar of the post-CTE age. While the NFL recently settled a concussion-related class-action lawsuit for $765 million, concerns over the sport’s safety have never been higher, and this intensity should only increase with the debut of Frontline’s League of Denial documentary this October. The conversation around RG3’s knee is not quite as fraught as the one we’re having about players’ brains, but it’s a symptom of the same fundamental problem, and when the expectations of a sport are thrust onto a player at a moment when that sport seems completely unsure of what it expects from itself—well, one wonders how much symbolic burden one body can take, however messianic that body might be. And so we’ll sit on couches and in the stands and read that right knee like a groundhog’s shadow, shouting our consternation every time Mike Shanahan calls for the zone read or every time he doesn’t, and nodding our approval every time Robert Griffin III tucks himself into a slide, or every time he doesn’t. And when the day arrives that RG3 finally stops playing football, whether it’s many years from now or quite a bit sooner, we’ll almost certainly view both his career and his sport differently than we do today. The tricky part about transformative athletes is that sometimes they actually do transform things, just not in the ways that we’re all expecting, or think that we want to see.